The best scope magnification to use is the lowest magnification setting where you can see a clear view of your total target. If the power is too low, you may not have optimal shot placement or even see your target very clearly. If the power is too high, then you may have trouble with target acquisition if your game moves, or you won’t be able to see your target’s surroundings. What if there’s a bigger buck in the background? What if there are obstacles or something that can be unintentionally damaged behind your target? This is the reason why low-powered scopes are becoming a thing, and adding the variation of going from no power to higher powered capabilities only sweetens the deal and expands your options. In terms of these low-multi-powered scopes, welcome to our top five best 1-8x scopes to use. For a 1-8x scope, the biggest sell point is going to be the magnification options. A 1-8x is a very unique and versatile scope, as it offers the close range capabilities of a non-magnified scope, and in going up to 8x power, can potentially engage rather long distances up to 800 yards. As a general rule, you want your magnification setting to be on the lowest setting possible that gives you the best clear shot of your entire target. This serves a few purposes. First is target acquisition. If you are totally zoomed in on the center of that deer chest, you will have a hard time following him when he moves. Second is peripheral vision. You want to be able to see your target’s surroundings or if there are other hazards or better target nearby. How many people hunting bucks think they see horns, zoom in too far and make the shot, only to realize that had they been zoomed out a little farther, they would have noticed it was a doe near some low hanging branches? Oops. Basically, the ability to see the whole target and what’s around it helps follow cardinal shooting rule number four: know your target and what’s behind it. You should not take the shot without this view. Some scopes say that they are a 1x scope, but really they are a 1.5x, and so have some level of magnification. It’s not a lot, but there are some competitions and hunting seasons that require the use of specifically a non-magnified scope. In close range engagement situations, it would be better to not have any magnification for the sake of quick target acquisition and the fastest shooting possible. This is why is it important that if the scope says 1x, it is a true 1x and not a 1.5x. The focal plane you choose is personal preference, but it can affect the way that you shoot so is important to know which you prefer. The first focal plane is where the reticle size changes with the zoom. The second focal plane is where the reticle doesn’t change in size, it is always the same. Second focal plane scopes are more user-friendly since the reticle always stays the same and so is more constant. First focal plane scopes are cool, but they can be very hard to see at lower magnification, and at higher magnification can actually cover up some of your image view. Related Read: First Focal Plane Vs Second Focal Plane For Hunting. There are a number of different reticle choices out there, but it seems that the most common used with the 1-8x magnification scopes are a BDC type reticle. The illumination can act as a red dot for lower magnification settings, and the BDC will work properly only at the highest magnification settings. Below is our break down for each of the 5 scopes on our list. Any of these 5 scopes would be a great selection but you may find one more suitable to your own personal needs. They’re not in any particular order. The Vortex Optics Strike Eagle is considered by many to be the best 1-8x powered scope out there. The lowest power range is a true 1x setting which is amazing for close distance engagement and quick target acquisition, while the 8x high-end can handle long range targets. The lenses on this scope are high-quality and fully multi-coated for a crisp, bright sight picture and optimal low light performance. The glass-etched, second focal plane BDC reticle is illuminated, and features 11 settings of illumination to accommodate for changing light conditions. The turrets are capped with enough room in the windage cap for spare battery storage. The rugged body of the Strike Eagle is a shockproof designed one-piece 30mm aircraft-grade aluminum tube that’s nitrogen purged and O-ring sealed for waterproof and fog proof performance. The eyepiece offers ample eye relief and a fast-focus dial for quick reticle sharpness adjustment. Overall, this is a powerful ally for your rifle! Customers of this scope enjoy the solid construction, the quality of the optic for the price and say that it holds zero well. The glass is clear and bright and the people like the illuminated reticle. Conversely, some have complained that the eye-box can be finicky and the magnification gets a bit blurry after the 6x setting. The primary Arms 1-8x24mm is a second focal plane scope designed to keep the reticle size the same at all magnification levels. The reticle is a patented ACSS reticle that combines bullet drop compensation, wind holds and moving target leads all in one easy to use system. It allows you to be very fast at 0-300 yards and very accurate at 400-800 yards. Plus, the reticle is illuminated with 12 adjustable brightness levels. This scope is durable. Constructed of 6063 aluminum, it is nitrogen purged to be waterproof and fog resistant. The capped turrets on this scope are low profile and finger adjustable, which is very convenient. It comes included with a pair of flip-up lens covers and a CR2032 lithium-ion battery. Another great scope at an excellent price point! Customer love this, and the high quality of the optic with a crisp, clean reticle and beautifully clear glass. People tend to love this ACSS style reticle, and it holds zero very well. Customer negatives include blurry sight at the higher magnification settings and the ACSS reticle only is designed to work at the 8x power setting. The Trijicon AccuPower offers both rapid target engagement and long-range precision with a true 1x power non-magnified setting to an 8x power setting. This first focal plane scope is perfect for any competitive, tactical or sporting application. The turrets on the Trijicon are finger adjustable, locking turrets with ¼ MOA per click increments. Being a first focal plane, the illuminated reticle will adjust in size to match the magnification level. Another great feature of this scope is the 28mm objective, as opposed to the more common 24mm objective. If bigger is better makes sense to you, then you can see the advantage of this difference. Even that 4mm diameter size difference will increase your field of view by nearly 12% and has more light gathering capabilities. The down-side to this is that this non-typical objective size is more expensive. Customers rave about this scope, saying that it’s the best scope out on the market. The glass quality is superb, and people appreciate the locking turrets. No negative reviews found. With a low powered to higher powered magnification combination range scope, it can be a challenge to find the combination of affordability and functionality. The Visionking Optics 1-8×24 scope is a budget-friendly optic that is rugged and absolutely waterproof and fog proof. It features a nice long eye relief with an illuminated dot reticle and fully multi-coated lenses. The turrets are a 1/10 MIL low profile style. This also is a first focal plane scope with a size changing reticle to match the magnification setting. Customers of this scope are very happy with it and say it functions well and has clear glass. No negative complaints noted. It’s a nice, low-priced solid scope. 1-8X MAGNIFICATION: Fast at 1x and extremely accurate at 8x remaining true at all magnifications. RUGGED AND DURABLE: Constructed with rugged, high strength aluminum alloy capable of handling heavy recoil and abuse. LIFETIME WARRANTY: If a defect due to materials, workmanship, or normal wear and tear has caused your product to malfunction, Primary Arms will either repair or replace. Finally, we have the Primary Arms Platinum Series. This scope is incredibly fast at 1x power and extremely accurate at 8x power, and holds true at all magnification levels. It features the illuminated Advanced Combined Sighting System (ACSS) reticle, which combines bullet drop and wind drift compensation, automatic ranging, and leads for moving targets all in one easy system. This scope is rugged and durable, constructed with high strength aluminum alloy. It is capable of handling abuse! Just in case, however, it also comes with a lifetime repair or replace warranty. Customers report that the optical clarity is awesome and an amazing eye-box. The 1x power holds true, and the reticle is crisp and dead-on. The only real negatives about this scope are that it’s a bit on the pricey side and it is heavy. Why would you need a non-magnified scope? – Some competitions and hunting seasons require that no magnification be used. It is nice to have a scope though. The glass, aiming point and lens treatments can make for a clearer and sharper view of your target even without being magnified. What is the best focal plane for a 1-8x scope? – This is personal preference. I tend to lean towards a first focal plane scope normally, but for this type of scope would definitely use a second focal plane. With such a drastic variation of power, I would think it would be easier to have a fixed reticle. When would you use a 1x magnification scope? – 1x power is non-magnified, so you would use this in the instance of a no-magnification competition or hunting season. This power level would also be ideal for close quarter tactical engagement, as it allows for a more rapid shot to be achieved. What is the best type of gun for this kind of scope? – When I think of close quarter engagement I think of combat, and would definitely put this scope on a tactical-style rifle like an AR, which is fully capable of both close-range and long-range shooting, and also can be used in hunting applications. These 1-8x magnification scopes really are amazing, just simply because of the magnification variation that’s available to you in one little unit. It really opens up your options and allows for a whole range of shooting applications. 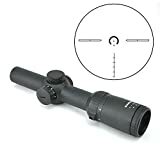 Now that you are a little more educated on the best 1-8x scopes, I hope that you possibly know if that’s what you are looking for. Hopefully, this guide has been helpful and enlightening to you. If you do decide to go with a 1-8x scope, take it out and shoot it at all power levels and distances. Get really comfortable with it and then decide how you like the magnification ranges offered. It might just be the best scope you’ve ever had! You may also be interested in our article on 1-6x scopes.